Discover all about iconic designer William Morris and use the latest fabric range to create a quick English paper-pieced hexie pouch. Celebrate tropical plants and birds with Lynne Goldsworthy’s stunning Monsoon quilt! 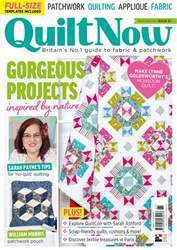 Join in Part 5 of our exclusive quilt-along with Jennie Rayment! 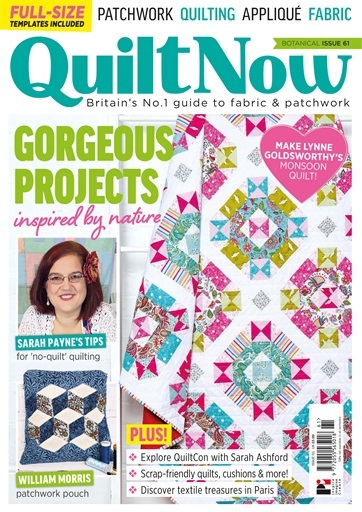 Discover how to quilt ‘without quilting’ in Sarah Payne’s expert technique guide. Sarah Ashford gives you the low-down on this year’s QuiltCon in Nashville, while Naomi Clarke shares all about her textiles trip to Paris. Recreate your hometown or favourite local landmarks with Amy Ball’s incredible panoramic wall hanging. Janet Goddard encourages us to rifle through our stash to create a wonderful scrappy card trick quilt.